The Olympics have given us the opportunity to meet the wonderful city of Rio de Janeiro. The landscape of Guanabara Bay, the famous beaches, Sugarloaf Mountain, Lagoa and the tropical forest are so beautiful, it feels natural that the Portuguese selected this place as the capital of their empire, while Napoleon’s Army occupied the Iberian Peninsula. Rio de Janeiro remained the capital of Brazil after its independence, until the foundation of Brasilia in 1960. Today, it remains the symbol of the whole country. Rio, like many host cities before, has tried to harness the Olympic experience to showcase the friendly face of Brazil and leave a legacy. This friendly face is evident in the beautiful opening ceremony, the incredible sports arenas and fair treatment of the entire Olympic family. Rio was a great Olympic host amid a political crisis, an economic recession and great social disparity. Given the economic and social state of Brazil, however, is legacy worth the Olympic cost? Rio’s reported Olympic budget is 37.6 billion reais ($11.9 billion), of which 24.1 billion reais ($7.6 billion) are for city infrastructure and 7 billion reais ($2.2 billion) are for the Olympic committee. Like Olympic Games before, the final costs are higher than initial projections. All the Olympic Games between 1960 (Rome) and 2012 (London) had cost overruns of 179 percent, and London was the most expensive in history ($14.8 billion), with cost overruns of 101 percent. Rio is not far behind, already reporting cost overruns of 51 percent. The Olympics are not the only event Brazil has organized in recent years. It hosted the FIFA World Cup, the World Youth Congress and Pope Francis, Rio+20 UN Conference on Sustainable Development and the World Games of the Armed Forces. In order to prepare for these events, Rio had to advance its mobility infrastructure, particularly its mass-transit. While it has been costly, the city created necessary infrastructure that otherwise would not have been built or would have taken decades. Large city projects include a metro extension, the construction of a downtown light rail, a large-scale renewal in the old urban port area (now Porto Maravilha), the construction of several BRT lines (Transoeste, Transcarioca and Transolímpica), bicycle path advancement and public space and sports venue improvement. The metro extension of 16 kilometers (10 miles) opened on June 30, just days before the Games, to Olympic families and attendees of ticketed events. It connects the beaches of Ipanema and Copacabana to the suburb of Barra de Tijuca, the Olympic park. During construction, the cost of the project doubled from about 5 billion reais ($1.4 billion) to 9.7 billion reais ($2.8 billion, $175 million per kilometer). The light rail (VLT Carioca), a 28 kilometer (17 mile), single line, came into service on June 5, two weeks after the announced date. It has an estimated cost of 1.2 billion reais ($370 million, $13 million per kilometer). The new BRT lines in Rio have been launched gradually, expanding with each major event. Transoeste, a 56 kilometer (34.7 mile) line from Barra de Tijuca to Santa Cruz, opened in 2012 for Rio+20. It services 250,000 passengers per day and cost $343 million ($6 million per kilometer). Transcarioca, a 39 kilometer (24.2 mile) line opened for the FIFA World Cup Football in 2014. The line connects the international airport to Barra de Tijuca, carrying 450,000 passengers daily and had a cost of $758 million ($19 million per kilometer). Transolímpica, a 26 kilometer (16 mile) line, was put into partial operation on July 10 of this year, for the Olympics. So far, the line has cost $400 million ($15 million per kilometer). 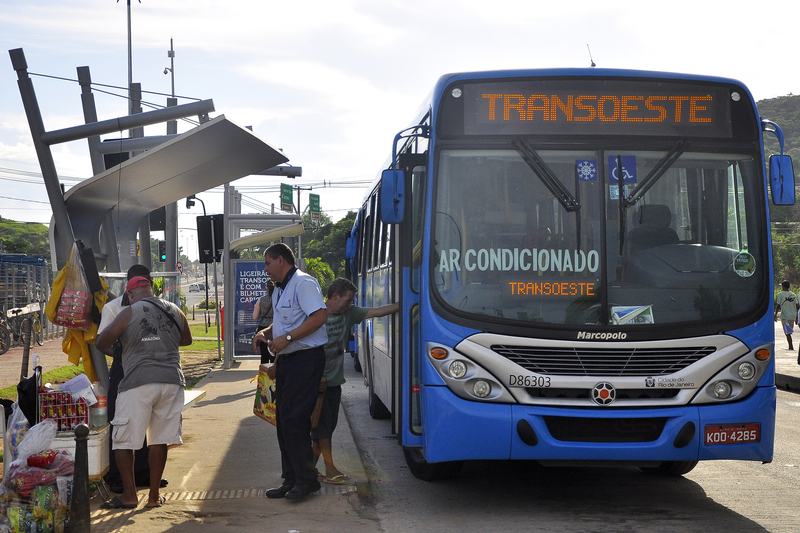 In total, Rio constructed 121 kilometers (75 miles) of BRT in just seven years. This accomplishment stands out when compared with Mexico City, which completed 125 kilometers (77.6 miles) in 11 years and Bogotá, which completed 113 kilometers (70.2 miles) in 18 years. Perhaps the most impressive Olympic project is the renewal of the urban port, Porto Maravilha, encompassing five million square meters (1.93 square miles) in the old industrial harbor area. The project includes the demolition of an elevated highway, construction of a road tunnel, enabling of public spaces and construction of the Museum of Art and the Museum of Tomorrow. The total cost of the project was $2.2 billion financed through real estate development in city. Mayor of Rio Eduardo Paes is very happy with the city’s infrastructural improvements. Changing the city is impressive. International events are able to create this transformation by drawing on federal support and private participation. We all enjoy the Olympics, but the inhabitants of Rio will continue to enjoy a different city at the end of the Games.